You bought your pool for a number of reasons like family fun, exercise, entertaining and possibly even therapeutic reasons. However you've probably found that without heating your pool it's often too cold to enjoy. Heating your pool will allow you to enjoy it all season, perhaps all year round, thereby increasing the return on your sizable investment. What heating systems are available for heating my pool? Solar Heat: This is obviously the most environmentally friendly way of heating your swimming pool. Heat Pump: This Heating system works effectively like a reverse air conditioner. This system operates off of electricity for power & derives its heat from the air around the unit and transfers it into the water. Gas Heater: This swimming pool heating system derives its power from gas whether it be Natural or LP and heats the water by burning that gas. What is the difference in heating systems? Solar Heaters: Solar Swimming Pool heaters are the most environmentally friendly due to the fact that there is no fossil fuel needed to operate them. They derive all there heat from the sun. Unfortunately if there is no Sun ,clouded sun or the sun is lower in the sky due to the time of year it is there isn't as much heat generated by the solar collectors to transfer to the water. In warmer climates like we have here in Orlando and the entire Central Florida area a Guardian swimming pool solar heating system can add many months of swimming enjoyment to your pool. Heat Pump: A heat pump operates off electricity and works by removing the heat from the air around the unit itself and transfers that heat to the swimming pool water. Although by needing electricity to operate they are not as environmentally friendly as a solar system the cost to operate is much less than a gas heater. There are draw backs to any heating system and the draw back to the use of a heat pump is two fold, the cost of the electricity to operate it and the other is the inability of the most units to produce heat if the ambient temperature around the unit reaches 55 degrees F. or below. This is due to the lack of heat actually available for the unit to extract from the air. Gas Heaters: This form of heating is less environmentally friendly way of heating your pool due to the need to burn gas to create the heat to transfer to the water. If you want to guarantee yourself heat all year round this is the way to go, but be prepared to pay for it. To heat the average pool through the winter could cost upwards of $1000.00 - $ 1500.00 per month and these figures could go up dramatically depending on the air temperature outside and the size of your pool and exposure to wind. What swimming pool heating system do you recommend? That is a difficult question, In theory a combination of all three would get you the most heat and the most cost effective to operate, if you wanted to guarantee heat all year long. The use of two of the three would be next best, If you had solar it could be backed up by a heat pump or gas in the rare occasions you would want the water warmer when the solar is not producing enough heat. I sometimes tell my customers especially if they have a spa to use the gas heater to heat your spa and then back up your solar heater on your pool with the gas heater since you already have it for your spa. 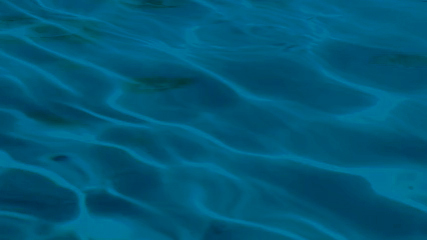 The Environment: Solar pool heating is clean , non-polluting and environmentally safe. Maintenance Costs: Solar collectors are not effected by corrosive pool chemicals and contain no moving parts to beak down. Warranty: We offer a limited lifetime warranty against factory or installation defects, as long as you own your home. Energy used is clean and unlimited. System cost is usually equal to or less than other heaters. There is no ongoing expense to operate your heater. After installation, all the energy generated is FREE from the sun. Solar heaters have no moving parts so they generally require less service and last years longer than other types of heaters. Solar pool heating systems are designed for swimmers who enjoy pool temperatures from the mid 70s to the upper 80s (even low to mid 90s in some climates). 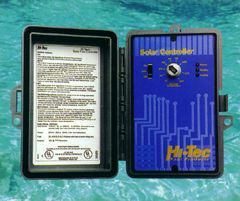 The solar pool heater adds degrees to your pool water (often 10-15 degrees). By adding heat to your pool, you may add months to your swimming season. In Central Florida, for example, unheated pool temperatures are usually in the upper 60s or low 70s during November. A solar heated pool will have temperatures in the upper 70s or low 80s. All you do is set the desired pool temperature on your solar controller (see #1 in the diagram) and the sun does the rest. When your solar controller senses (#2) that there is enough sunlight to heat your pool and that your pool is colder than you desire, water is automatically diverted (#3) to your solar system (#4). Your pool pump (#5) sends pool water to the solar collectors. As the water flows through 120 tubes in remove this each solar collector, the sun's energy heats it. The solar-heated water then flows back to your pool. This simple cycle continues until your pool reaches your desired temperature. Full Flow Panel, "Low back pressure & Flow restriction to water features"
Adjustable Mounting system "ability to move Mounting bracket to where roof truss is"
Aluminum Flashing under bottom header "Prevent roof damage from Header movement"
Black pipe & fittings on roof "not white pipe & fittings painted black"
Clean & professional tight fitting piping around eve and under soffit "Not just square"
90-180 days same as cash or revolving financing "1 hour credit approval"
The plumbing for your Guardian solar system is plumbed directly into the existing swimming pool or spa filtering system. During the day while the swimming pool or spa filter is operating the cold water is sent through your Guardian solar collectors that are heated by the sun, that heat is transferred from the collector to the water and then returned to the pool. We automate all our systems so the solar installer will add a controller and sensors to operate a valve sending the water directly back to the swimming pool or through your Guardian solar collectors to be heated. This roof mounted sensor will monitor the temperature on the roof as well as the temperature of the water. If at anytime the roof temperature drops 2 degrees below the water temperature, the system will automatically be turned off as to not start cooling the water. This comes into effect mainly when it rains, or if you run your pool at night for special occasions. If the water temperature reached it desired pre-set temperature the system will then again be turned off as to not over heat the pool. 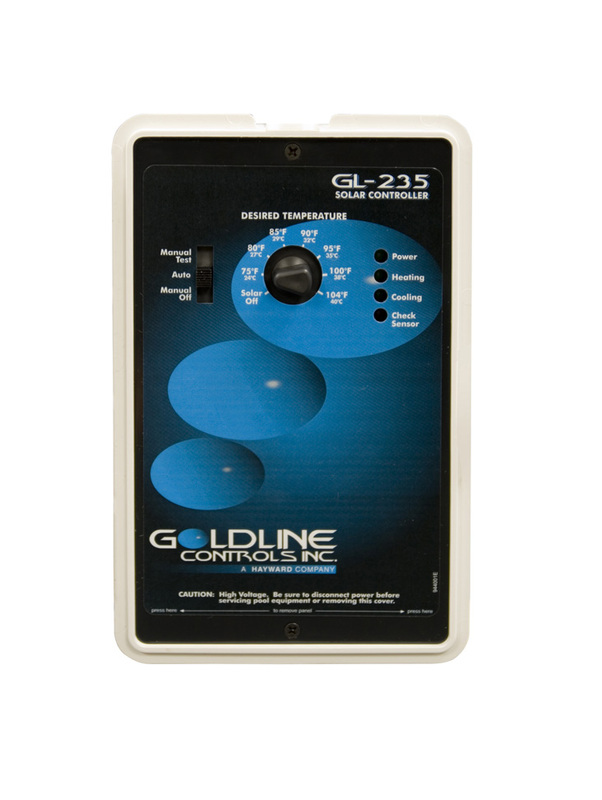 This increases the efficiency of your Guardian solar system over other systems that may not be automated and require you to manually turn on and off your system. Why should i use automation? We never install a manual Guardian system for this reason. In a more basic system the homeowner sets the valve manually to run through the collectors while an automated timer turns the filter system on during those hours the collectors will receive direct sunshine. The problem with this method of installation is that the water can then get too hot and uncomfortable to swim in or if it rains or you run you pool at night you can actually be cooling your pool rather than heating it. You would have to constantly monitor your system. We strive for not only efficiency, but convenience of use. How practical is a swimming pool solar heating system? Solar heating of swimming pools is one of the most economically practical uses of solar energy. A Guardian solar swimming pool heating system allows you to extend your swimming season, gives you more control over water temperatures and for many installations there is no increase in operating costs. 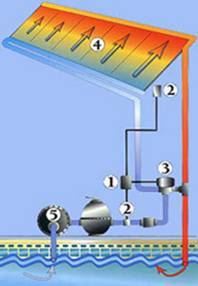 How efficient is a solar heater? Central Florida is a great place for a swimming pool solar system. Our Guardian solar panels output is 1000 BTU's (British Thermal Units)- per square foot panel surface area. So for example if you have a 4" x 12’ solar panel, you have 4 x 12 = 48 square feet of solar panel surface area therefore you multiply 48 square foot x 1000 BTU’s = 48,000 BTU’s of heat being produced at the optimum sun exposure. This comes into play when comparing panels, so be sure to use your own calculations before you buy, to see the value you are getting for your money. You wouldn’t buy a car that would get 10% less gas mileage would you? Do i need a solar blanket? Although your new Guardian solar system will perform extremely efficiently to heat your pool, the swimming pools surface area is where you can loose your heat. It’s recommended that you use some sort of swimming pool cover to hold in the solar heat your Guardian solar system has generated. One sure clue you are loosing heat is seeing steam coming off the surface of your swimming pool. There are liquid solar blankets available and work better then no blanket at all & are less cumbersome therefore probably in most circumstances will be more effective just because they are being used. They will typically hold in 40% of the heat when the water is still, which normally is out night when most of your heat loss will occur anyway. How much will a swimming pool solar heater cost? The size and cost of a solar swimming pool heater will depend on the size of your pool and your location, Central Florida as well as Orlando is a great place for a swimming pool solar system due to the warm climate many month of the year. To determine the best value of a solar swimming pool heater, divide the total cost by the total square feet of panel needed. The lower the cost per square foot, the better the value as long as the BTU rating on both panels are the same. How much will a solar heater cost to use? The operating expense of a swimming solar pool heater comes from your electric bill resulting from the normal operation of the pool pump. The pool pump must be in operation for the solar heater to function. There is no cost for the solar power itself. What size solar heater do i need for my pool? The amount of sun exposure your solar panel’s surface area receives determines the temperature of your swimming pool and the amount of time it takes to heat it. The proper size and amount of solar panel surface area will ensure its efficiency in heating your pool. There are several factors that will determine the size of the solar system you will need. They are, but not limited to the size and shape of your pool, and the amount of shade provided by trees, canopies, and enclosures. The area in which you live, the weather conditions to your area and the water temperature you desire your pool to be need to be considered as well when selecting the right size of pool heater. The roof orientation is another determining factor in calculating the amount of solar collector surface area that is adequate to heat your swimming pool. Obviously a full southern exposure is best, west would be the second best for sun exposure east is less than west ,but still adequate and rarely if not never is the north a good choice for optimal performance. Should you choose to heat your pool using solar energy, Guardian solar panels are available in a range of sizes: 4x8, 4x10, and 4x12. Your Guardian panels are also available in the same lengths, but in 2’ widths. Every Guardian solar system is customized to accommodate your specific roof size. Guardian solar panels are typically lined in a row on the roof. There is no typical installation due to the many different configurations of roofs. They can be positioned in a straight line or stacked or even offset and many times on different sections of roof all together. The directional placement of panels on your roof is crucial. The panels need to be placed where they will receive the maximum amount of sunlight possible. How long will my solar heater last? A quality solar system will typically last 10 to 20 years. They are very low maintenance. Most systems come with a 10 year warranty on the panels. The Guardian system comes with a limited lifetime on the panels themselves. Does the installation of a solar system require a permit? Absolutely - and avoid any company that wants to do it without pulling a permit. If you ever have an issue down the road with your system that may involve your insurance company they will want to see that it was installed properly in the first place. The only way for to prove to them that it was is by it passing final inspection. Without that you are on your own. Why our panel over the others? Differences in leading products will be more noticeable when comparing durability and future needs for service. Nearly all polypropylene plastic solar pool panels (as opposed to a rubber materials like EPDM) are highly reliable and should last between 10-20 years. Solar World's products seldom require service and can be expected to last even longer than most polypropylene panels. Our material blend has already been proven to withstand even the harshest climate conditions. Our absorber is a "tube-on-fin" design which not only attracts the sun's rays efficiently, but also naturally permits horizontal and vertical expansion and contraction (expansion & contraction is the second most damaging element to solar panels -- the sun itself is the first). Our unique assembly procedure provides the plastic industry's strongest possible bond. Our headers (which carry pool water to the absorbers) are molded directly over the absorber. This differs from others that less securely weld their parts together. Our factory is the only one to mold its header directly over a "tube-on-fin" absorber. The solar panels roomy water passages are designed to minimize increases in water pressure. This feature is becoming more important as more pools are adding additional products, like "in-floor" cleaners, which raise system pressure near maximum recommended limits. Since our panels are built with the most secure manufacturing process for plastic available today (molding), and because of its "sure fit" fastening method, Solar World systems virtually never leak, on installation or after. When it comes to reliability there is no equal. Each fin between the tubes of the absorber has been built with a "tear line." This line allows an installer to easily separate tubes in the middle of a panel, permitting its installation over the top of small roof obstructions, like vent pipes. This allows solar arrays to be installed in their optimum position on the roof, and saves on costly additionall hardware. The round tubes of the solar panels absorber may be easily repaired in the case of any product damage. Available plugs may be installed within minutes, and are invisible without careful scrutiny. The panels absorber serface is built for "sure-fit" fastening. With its molded header ends, we utilize the proven "hose and clamp" method of fastening panels together (which buffers horizontal expansion) with the most leak-resistant connection in the industry. As a result of this carefully designed feature, the panels also require less roof space than any other similarly fastened panel. Guardian solar panels are some of the most technologically advanced solar absorbers on the market today. We use the solar panel to capture the sun’s natural energy and use that energy to heat your swimming pool water. Since Guardian solar pool panels use the sun as its energy source, no polluting by-products are released, and none of the world’s limited sources of energy are depleted. By using the sun’s natural energy to heat your pool you are doing your part to conserve energy and reduce your personal carbon footprint. What are the technical specifications on the guardian panel? Most companies will not off this information readily because they don’t want you to be able to easily compare solar collectors. We advise you to just that to make sure you are getting your monies worth. What is the warranty on my new guardian solar system? Pool Heating Solutions by B.M.Wemple Pools Inc. (hereinafter PHS) warrants the solar panel installed by itself PHS a duly authorized Guardian distributor, to be free from defects in materials and workmanship at its original installation location, from date of purchase. All aspects of this warranty are subject to the following limitations, terms and conditions. If the panel is determined to have a defect in material or workmanship, PHS will, at its sole discretion, Will repair or replace the defective panel at NO CHARGE to the CONSUMER, including labor for the life of the panel to original owner and installation address. This warranty includes damage due to freezing conditions so long as the valves and panels are maintained in the same condition as when installed by PHS allowing panels to drain fully when system is off. This Warranty extends only to the Consumer for damage resulting from defects in materials and Workmanship. It does not extend to damage caused by the Consumer’s neglect or abuse, or by Accident, to damage caused by wind, hail or abnormal weather conditions, or to damage caused by Acts of God, civil insurrection or extraordinary circumstances, which are beyond the control of PHS. PHS shall not be liable for any direct or indirect damage resulting from the use of this panel, and in no event shall the extent of this warranty coverage exceed the purchase price of the panel. This warranty excludes any panel, which was not installed by P.H.S. an authorized Guardian distributor and excludes any panel on which the date code has been altered or removed. Any tampering or attempted repairs by anyone including the Consumer will void this warranty. In order to be considered for validation, all claims must be accompanied by a copy of the purchase agreement indicating the date of original installation, & original purchasers name or service invoice (which shall include date code (s) of panel (s) serviced by the consumer. PHS reserves the right to inspect any panel (s) prior to honoring any Warranty claim. Yes we have 100% financing available to qualified customers & can normally get you an answer with a matter of hours.